Dubai: The UAE’s glorious Gulf Cup winners are continuing their home-coming tour, following their historic 2-1 win over Iraq in Manama, last Friday. It’s only their second title in the tournament’s 43-year history and their first under an Emirati coach. They last lifted the eight-team biennial competition back in 2007 led by Frenchman Bruno Metsu. 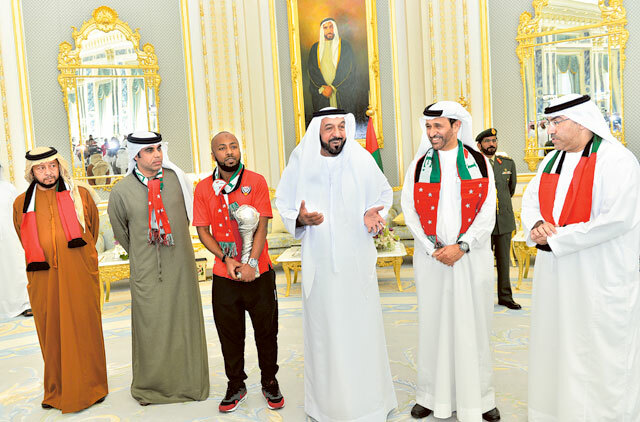 President His Highness Shaikh Khalifa Bin Zayed Al Nahyan hosted an official welcome party for the 23-man squad at Al Ain’s Al Rawda Palace on Saturday, where Shaikh Khalifa led the accolades for coach Mahdi Ali’s cup-winners. Shaikh Mohammad Bin Rashid Al Maktoum, Vice-President and Prime Minister of the UAE, staged another gathering for the prized players at Zabeel Palace on Sunday, as the trophy roadshow gathered pace. An estimated 18,500 UAE fans descended upon Manama for the final at Bahrain’s National Stadium and so vehement was their support that approximately 3,000 of them were denied entrance to the venue for fear of over-crowding. Manama airport struggled to cope with the influx of 30 additional flights put on for the UAE’s loyal support, but despite outbound delays all 11,000 air passengers returned in celebratory mood, as they were handed roses and UAE scarfs upon arrival. 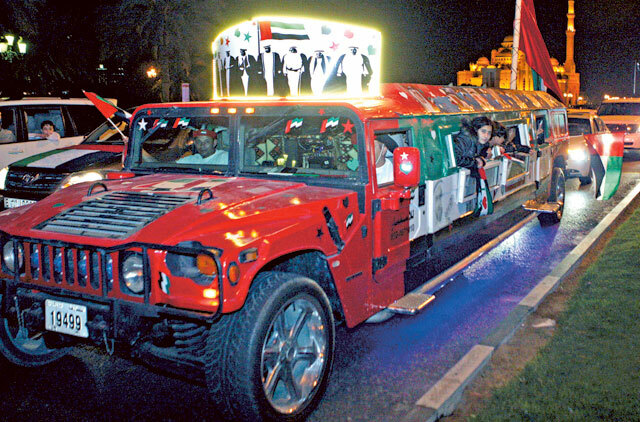 The other 7,500 odd supporters drove back in jubilation through Saudi Arabia, in cars decked with flags and chassis adorned in red, white, black and green. The win marks a turning point in the UAE’s footballing fortunes at international level. While the senior side had failed in their bid to qualify for the 2014 Fifa World Cup, Mahdi Ali’s youth squad, under his tutorship since 2006, had always given the nation hope for the future. The ‘Golden Generation’ qualified for last year’s Olympics, and made the quarter finals of the U20 World Cup, also winning the U17 and U23 Gulf Cups, the U19 Asian Cup, and taking silver at the Asian Games. But questions surrounding their ability to graduate to, and endure the toils of, senior level football, had surfaced in the run up to this competition with Asian 2015 qualifiers following in such quick succession next month. Their win will now ease those doubts and grant coach Ali the trust and confidence he needs to pursue 2015 Asian Cup and 2018 World Cup qualification, without calls for assistance from a foreign coach.